Green Mars is the middle book in Kim Stanley Robinson's Mars Trilogy. Green Mars begins around the turn of the 22nd century. Mars has been settled for several decades. Terraforming projects are incrementally inching the planet's atmosphere (and, increasingly, its developing biosphere) towards a more Earthlike new normal. New settlers are arriving and more Martian natives are being born. Meanwhile, Earth is a mess, dominated by a dozen or so 'metanationals', mergers of 21st-century-style multinationals and nation-states. These same metanationals are in charge of exploiting the natural resources of Mars. The surviving members of the First Hundred -- the first permanent settlers on Mars and the trilogy's main protagonists -- have mostly taken up the cause of a Free Mars, sovereign and independent of Terran metanationals' meddling. This is not, of course, to say that they agree with each other, or that there aren't deep philosophical disagreements that threaten to tear the cause of Martian independence apart. Green Mars is about the Martian people's decades-long march towards revolution. It's been a long time since I read the first entry in the trilogy, Red Mars. (I don't even remember what year I read it in -- I think it was 2008 or 2009.) It was probably a mistake to let my knowledge of the characters and backstory to lie dormant for such a long time, especially as when I began Green Mars I wasn't sure where to turn online to refresh my memory without inadvertently spoiling myself. If you are the kind of reader who must always have a good grasp of who each character is, what they are talking about, and what the past events they are obliquely referring to are, then you'd better read these three books in order, and (unless you have a good memory for details) without significant breaks in between. These books are vast, they are full of details, and nothing is ever forgotten. And Green Mars offers the casual reader no help at all. There's no helpful list of dramatis personae, and no introductory passage from the Encyclopaedia of Mars about the early years of Martian history, full of exposition to catch the reader up. On the other hand, if I were the sort of reader who always had to feel cognizant and in control, then I never would have gotten through Lau Siew Mei's Playing Madame Mao. I cheerfully got myself slowly back up to speed by quietly assimilating the references to what had gone before -- all of which, of course, seemed to assume the reader was already familiar with the events of Red Mars. Working my way through my stack of Kim Stanley Robinsons was practically a New Year's resolution for me. Robinson is a brilliant author, wields very well-thought-out concepts, and his books make me feel smarter. But I'll never call one of his books a 'page-turner'. It's clear throughout Green Mars that the installment will end with the people of Mars throwing off the yoke of their colonial oppressors, in an extraordinarily messy revolution that will require another 700-page novel to pick up the pieces. And Robinson sure takes his time getting there. Green Mars's sizable pagecount is devoted largely to two things. One is politics, and I just ate that up. I love a realistic depiction of political struggle when it's written as an exploration of human nature, and not for the author to advance some stupid agenda of his own. The other thing he writes about at great length is Mars, and this is where I found the book a bit of a struggle. And I feel bad about that. It's not like I can complain. 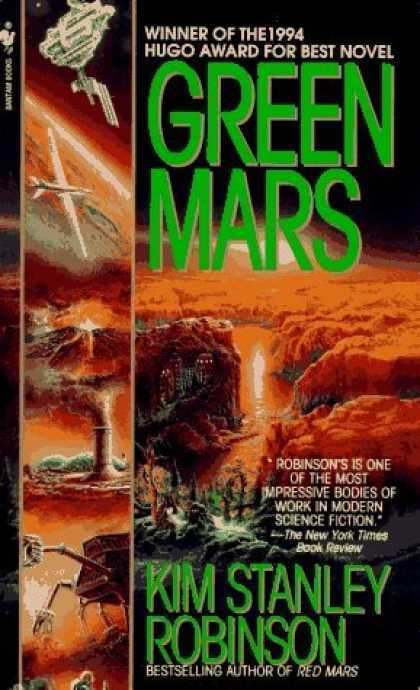 I'm not going to write in an Amazon review, Robinson's book about Mars, Green Mars, is pretty good except for the parts where he writes about Mars. 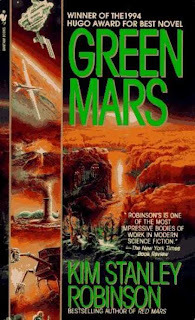 But one of Robinson's main goals in this trilogy -- in Red Mars, in Green Mars, and I expect in Blue Mars too -- is to make the reader feel the natural beauty of the Martian landscape. And he sets out to accomplish this through text. Lavish textual descriptions, filled with geological terminology. And to be honest, they left me rather cold. They are what make the books a long slog for me. I don't want to harp too much on the dryness of the 'Martian beauty' sections. They're obviously a central part of Robinson's vision. And he always gets back around to human beings and their psychologies and the march of history, which I enjoy reading about far more. My problem might just be that my brain's not wired to easily picture a visual image based on a text description. If I'm to appreciate something's visual beauty, I have to actually see it. And on that note, go look at this high-resolution picture of Victoria Crater taken from Cape Verde by the Opportunity rover.